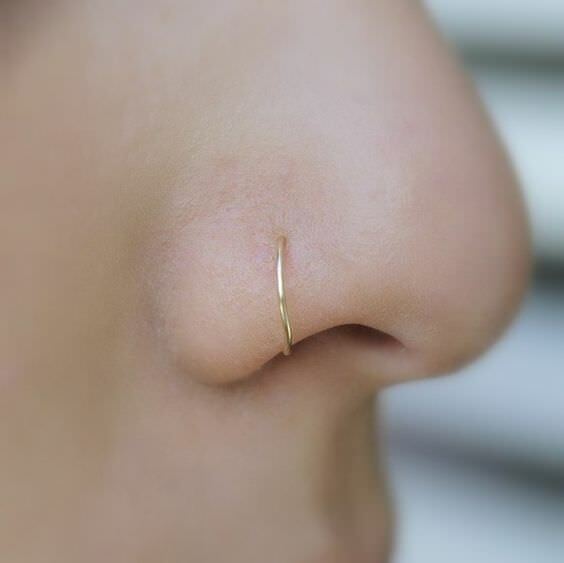 If you’ve had a stud in your nose since you got it pierced and want to try something new, you might be curious about putting in a nose ring. Nose rings are fairly simple to put in if you know how, but where do you start and how can you be sure you’re doing it right? We’ll go over the process step by step and give you a few pointers for doing it safely and without complications. Putting a hoop nose ring in your piercing is a straightforward procedure, but it’s important to do it right. The name of the game is really avoiding any damage to your piercing and reducing the risk of infection. With that in mind, follow each of these steps carefully. Wash your hands thoroughly. Your hands come into contact with countless surfaces throughout the course of the day, so be sure to wash them thoroughly with antibacterial soap before handling your jewelry. You can also use disposable latex gloves if you aren’t allergic to the material and want to be extra cautious. 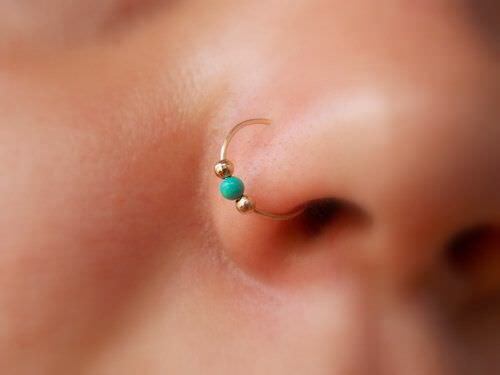 Clean the nose ring and the pierced area. Use a saline wipe or piercing spray to do this. If you have a captive hoop ring (those are the ones with a bead), remove the bead so you can clean the jewelry more thoroughly. Remove the bead or pull the ring open. Captive rings work on tensile strength – the only thing holding the bead in place is the pressure from both ends of the hoop. When you pull the sides apart, the bead will fall off. If you’re not using a captive ring, simply pull the hoop apart so that it opens enough for you to work with. If the ring is thick, this might be difficult to do with just your hands. You can use pliers but use them gently and carefully to avoid damaging the ring. Slowly ease one end of the hoop into your piercing. To make this easier, you can lubricate the jewelry by dipping the end of the hoop in some antibacterial soap. Close the ring. If you’re using a captive ring, replace the bead and allow the ends of the hoop to secure it in place. With other types of jewelry, simply make sure that you close the ring so that it stays in place and has the right shape. Putting in a hoop ring is quite easy, but that doesn’t mean there aren’t risks. The two risks you have to worry about are bacterial infections and tearing. Not cleaning your hands or your jewelry properly could transfer bacteria to your piercing, causing it to get infected. Pushing the ring through when the piercing isn’t wide enough for it, or not putting it in properly, could tear the skin around the piercing. Not only is this painful and unpleasant, but creating an open wound around the jewelry further increases your risk of infection. Here are a few tips to ensure that your first time inserting your hoop ring goes well. Putting in a nose ring only takes a few easy steps, and many people find hoop-style rings to be more comfortable than the studs they started off with. Just be sure to get a ring of the right size and clean it thoroughly before starting.